LIFEDesigns has always been viewed as an innovative service provider, providing integrated community services to people with disabilities across south central Indiana. LIFEDesigns is an established service provider, in operation for over 30 years. The ACL is the Administration for Community Living, a division of the U.S. Department of Health and Human Services. In their blog post on May 17, 2016 they highlight the uniqueness of how community integration is intertwined throughout all of LIFEDesigns services. The community integration is especially noticed in Supported Employment. After recently finishing their strategic planning to 2018, LIFEDesigns recognized that community employment was the number one most desired goal for the people they support. Currently about 32% of LIFEDesigns customers are employed in their community compared with only about 21% in Indiana. LIFEDesigns won’t stop there—by 2018 they hope to increase the percentage of customers working in a community job to over 50%. Using the nationwide EmploymentFIRST Initiative, LIFEDesigns has a plan to expand their capacity for employment supports to be able to achieve this goal in less than 3 years. With the support of the Community Foundation of Bloomington and Monroe County with a grant of $25,000, we will begin seeing the results of this effort early 2017. This initiative is seeking local business professionals for council on developing community employment and self employment opportunities within the local economy. Another key component of achieving full community integration is LIFEDesigns Community Education Opportunities program intended for adults with developmental disabilities who want to improve their social, employment, and life skills. The program features classes targeted towards improving fitness, social interactions, communication, self advocacy, cooking, and exploration of the arts. This program stands out because each class is held in a community location, and professionally skilled volunteers teach the classes. The customers attending these courses are more engaged in the learning activities and typically end up teaching the volunteers a little bit about disabilities as well. 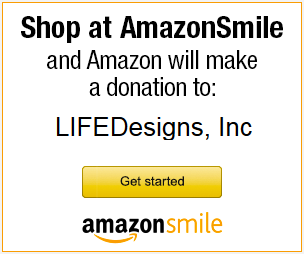 To learn more about LIFEDesigns and the benefits the organization provides to the community, explore our website or follow LIFEDesigns on Facebook or Twitter. CONTACT: Susan Rinne (800) 875-9615 for more information or to schedule interviews.